While most Central American capital cities have a reputation of being sketchy and unsafe, Panama City is a surprisingly pleasant city to spend a few days in. 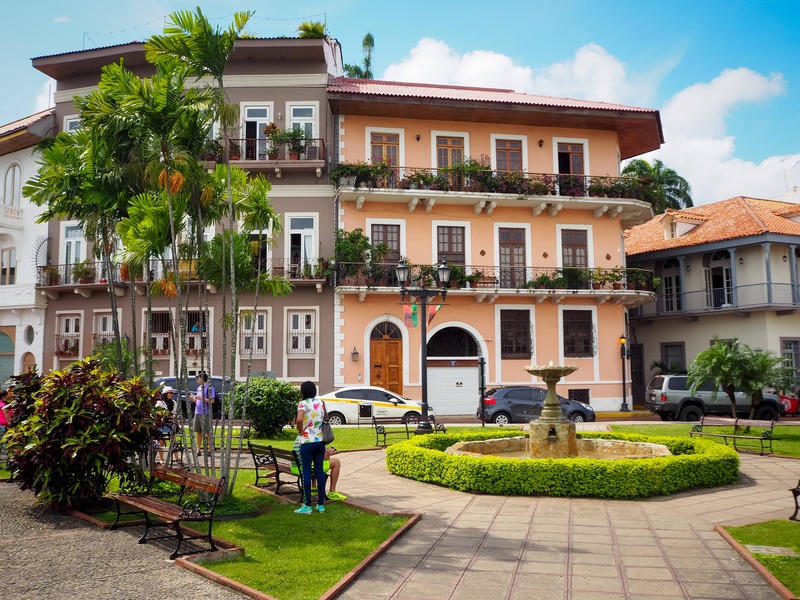 While Panama City is a good base to make certain day trips from, the city itself also has several nice sights to visit. Taxis are available nearly everywhere in Panama City. Panamanian taxis do not have a meter, so it is wise to agree on the price with the driver before taking one. Most taxis will start with $5 or $10 if they see you are a tourist, but about $3 should be able to get you almost anywhere around central Panama City. I preferred to use Uber over taxis, as you don’t have to worry about getting ripped off. Uber cabs run per distance and travel time, and are often nicer cars than normal taxis. I never waited for more than 5 minutes for an Uber to arrive anywhere in Panama City. 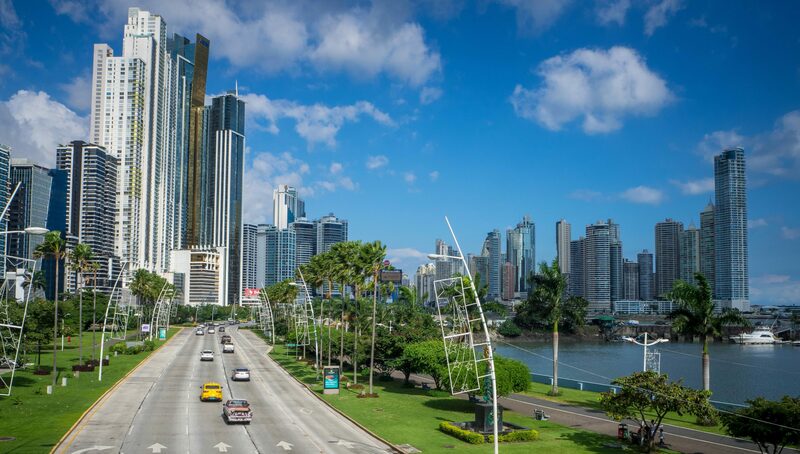 Panama City’s skyline with Avenida Balboa and the Cinta Costera stretching along the coast. There is currently only one metro line in Panama City, which just like nearly any Metrobus terminates at Albrook. Metrobuses are modern air-conditioned buses and carry no cash. You thus need a Metrobus card (which also works on the subway) to use them. Metrobus cards can be bought and charged at any metro station and many outlets (such as supermarkets) around the city: just look for the Metrobus logo. Most bus rides costs $0.25, highway buses to Tocumen Airport is $1.25. Metro rides cost $0.35. Where to go in Panama City? Panama City’s original Spanish settlement. Ruins dating back from the year 1519. Easily accessible by Metrobus (take any Metrobus along the Cinta Costera that says Panama Viejo and get off at Centro de Visitantes). Click here for more photos of Panama Viejo. Casco Viejo is a recently renovated historic part of Panama City, full of design hotels, local boutiques, hipster coffee shops and bars. Very nice area to explore by foot. You can walk all along the Cinta Costera to Casco Viejo, but be careful not to get into the areas surrounding Casco Viejo. 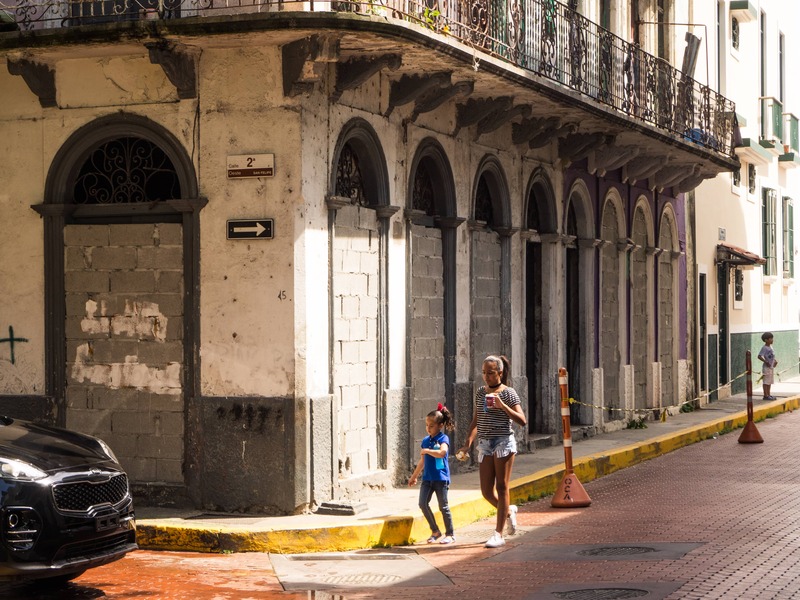 There is plenty of tourist police on the street and Casco Viejo itself is considered safe. The Cinta Costera forms a nice green strip with walking and sports facilities between Avenida Balboa and ocean, surrounded by skyscrapers in the back. The walking path stretches all the way from the Hard Rock Hotel / Multicentro Mall in the north, to Casco Viejo in the south. 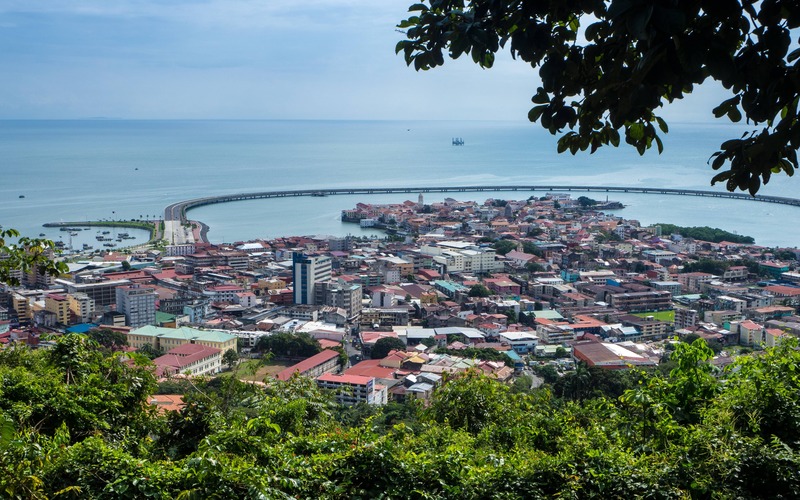 From the top of Ancon Hill you will have a magnificent view over Panama City’s Skyline, Casco Viejo, and the Panama Canal. Ask a taxi driver to drop you off at the security checkpoint at the bottom of the road that leads to the top of the hill. From there it is about about 30 minutes hiking to the highest viewpoint. Recommended to do in the morning. Via Argentina, located in El Cangrejo, is a very nice street in upscale area with lots of bars and restaurants. Easily accessible by metro. Metro staton: Via Argentina. There are countless shopping malls in Panama City. The one you will most definitely encounter is Albrook Mall, said to be the largest mall of the Americas. Albrook mall is located right next to the Albrook transport terminal. Multicentro is next to the Hard Rock Hotel, and more upscale Multiplaza is located in more of an office area just north of that. Metropolitan National Park is a national park with some short trails (doable in a couple of hours or less) right within the city limits. Very easily accessible by taxi. Apparently some people see many wild animals here in the early morning. I personally only saw raccoons and a nice view over the city. 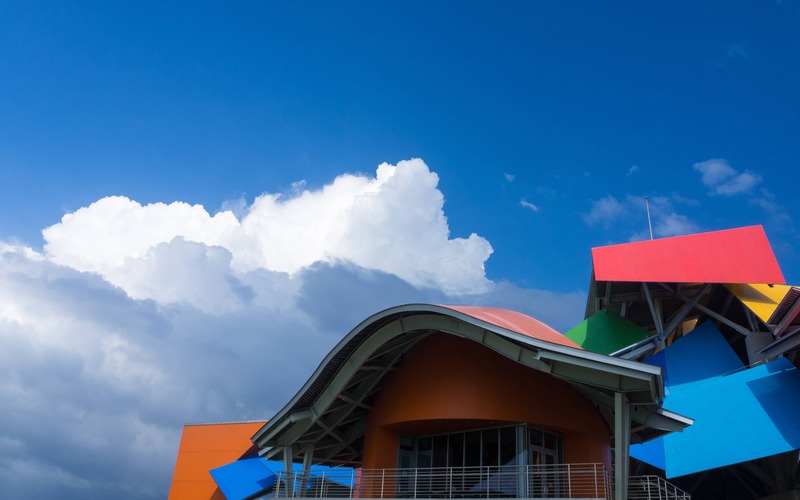 The Biomuseo is famous for its remarkable design by Frank Gehry. Unfortunately the museum was closed during due to Christmas when I went there, so I did not check the inside. However even if just for seeing the outside of the building it was worth the visit. Easily accessible by Metrobus from Albrook: ask for the Metrobus in the direction of “Amador” and get off once you see the Biomuseo. Try fresh ceviche for only $3! Located along the Cinta Costera within walking distance of Casco Viejo. El Trapiche provides inexpensive local Panamanian food. Located in Albrook Mall (north end, accessible via outside) and Via Argentina. Try Ropa Vieja (slow cooked beef) with patacones (fried green plantains – together with Yuca fries it’s Panama’s substitute to french fries). My Panamanian local friends took me to out for dinner at Mi Ranchito, located on the Amador Causeway. Lovely view and live music. Affordable local Panamanian food in a very nice atmosphere, I had the Octopus and it was good. 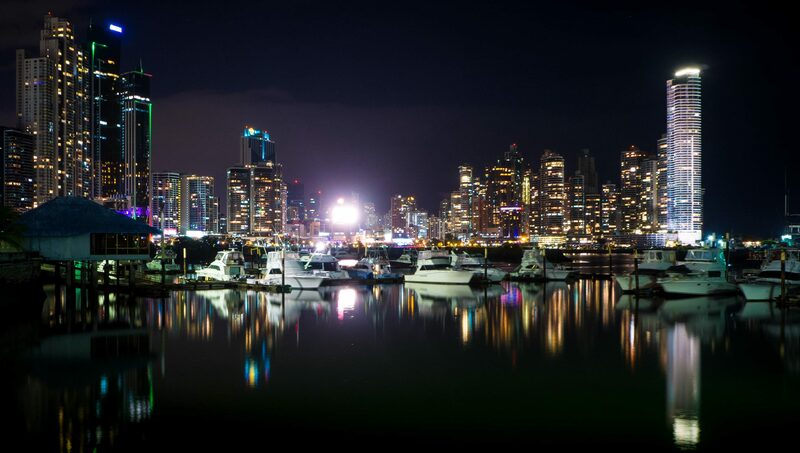 There are two main areas to go out at night in Panama City. The most famous one is Casco Viejo, Panama’s old town. There are countless (rooftop) bars and several clubs. I went to Relic, which attracts a fairly young crowd including many internationals. Tantalo is supposed to be more upscale. The other area popular for going out is called Calle Uruguay and is close to Marbella. I visited Altabar, which was nice although I personally prefer Casco Viejo. Renovated buildings in Casco Viejo. The Panama Canal is perhaps Panama’s most famous attraction. Visit the Miraflores Locks close to Panama City, or take the Panama Canal Railway along the canal from Panama City to Colon and visit the new (larger) Gatun Locks that were opened in summer 2016. The Miraflores Locks are easily accessible by Metrobus from Albrook. If you are interested in visiting the Gatun Locks by Panama Canal Railway like I did, read here how to [not] visit the Panama Canal Gatun Locks in Colon and Portobelo. Portobelo is a small ancient fisherman’s village on the Caribbean Northeast. Often combined with a visit to Isla Grande, though I combined it with a visit to the Panama Canal’s new Gatun Locks in Colon. Take the express bus to Colon from Albrook and get off in at the Rey Supermercado in Sanbanitas from where you can transfer to a local chicken bus that goes to Portobelo. Lago Bayano, perhaps Panama’s best kept secret, is peaceful lake with lots of wildlife only two hours from Panama City. Amazing river tracing through caves with thousands of bats. Natural pools waiting for you to swim in at the end! Surprisingly undiscovered by tourists. Read more. 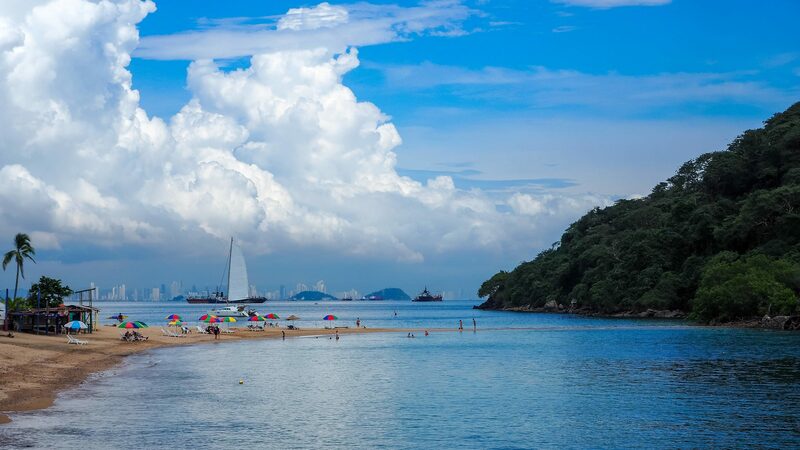 Taboga Island is a small island only 30 minutes by boat from Panama City. I took the Taboga Express ferry which is located on the Amador Causeway close to the Biomuseo. Perfect if you have day to spare in Panama City and just want a change of pace and relax on the beach, with view of the Panama City skyline in the background. Click here to view the video of my daytrip to Taboga Island. El Machico is a nice social hostel located in an upscale residential area, within walking distance from the Cinta Costera and Multicentro mall. 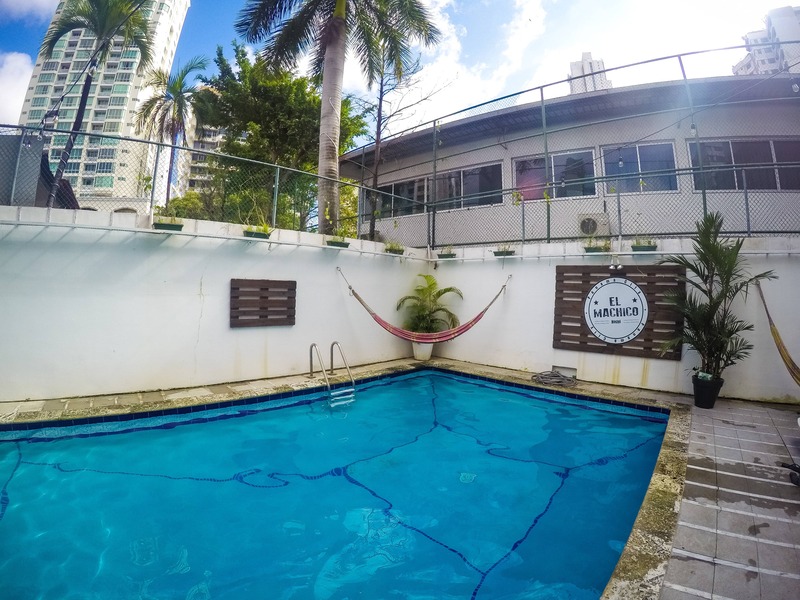 I particularly liked this hostel because of its swimming pool and atmosphere, it’s very easy to make friends here and it’s nice to start your day in the city with a dip in the pool. Dorms from $15. When I returned to Panama City I stayed at Lemon Inn, located in an office area. There is not too much to do within the direct neighborhood, except from the Multiplaza mall. A fair choice if you are looking for clean and simple budget rooms. Twin or double rooms from $30. Click here to see a one-minute video of my stay in Panama City including day trip to the Panama Canal Gatun Locks and Portobelo.